Bantham Beach is a popular family and surfing beach that looks out towards iconic Burgh Island. According to our ongoing poll, Bantham is South Devon’s most popular beach, which is quite an achievement given the array of spectacular beaches in our part of the world! Choose a quick link if you’re looking for specific information about Bantham Beach, or read on for the full article. See Bantham on a map and get directions. Parking charges, opening times and more. Click here for our quick guide to the beach. Find out more about the two delicious eateries at Bantham Beach. Learn more about Bantham Beach’s dog policies. We spoke to the experts at Bantham Surfing Academy about the ins and outs of surfing at this top beach. We spoke to a lifelong shore angler at Bantham Beach to get some insider fishing tips. How about a break near beautiful Bantham? Check out these wonderful accommodation options. Bantham Beach is on South Devon’s west coast, between the beaches of Bigbury-On-Sea and Thurlestone. The beach is within the South Devon Area of Outstanding Natural Beauty, and faces tidal Burgh Island, which is situated about two-thirds of a mile out to sea. For sat nav purposes, Bantham Beach’s postcode is TQ7 3AN. Bantham Beach is a little over eight miles from Salcombe. We advise taking either of these two routes. Leave Salcombe on Salcombe Road/A381, passing through the village of Malborough. Just over three miles past Malborough, the road will narrow and the white lines will disappear. Take the next left, signposted for Thurlestone and South Milton. Take the third right, signposted for Buckland and Bantham. Follow the road all the way to a T-junction in Bantham village, then take a left. The car park will be straight ahead. When you reach Malborough, follow the road around as it turns sharply right. About five miles later, you’ll come to a roundabout. Turn left. Simply follow this road until you see the car park for Bantham Beach straight in front of you. Dartmouth is just over 17 miles from Bantham Beach. Leave Dartmouth on the A3122, going straight on at the roundabout (onto Townstal Road). After seven miles you will come to a T-junction by a garage. Turn left, joining the A381. Turn right at the roundabout to stay on the A381. Turn right at the next roundabout, staying on the A381. You’ll pass through the village of Churchstow. Half a mile later you’ll reach a roundabout. Go straight on. Bantham isn’t served by any bus services, but the Tally Ho 875 from Plymouth stops at nearby Bigbury-on-Sea. Between May and September, a passenger ferry goes from Bantham Slipway to Bigbury-on-Sea, operating from Monday to Saturday from 10 to 11 am and from 3 pm to 4 pm. 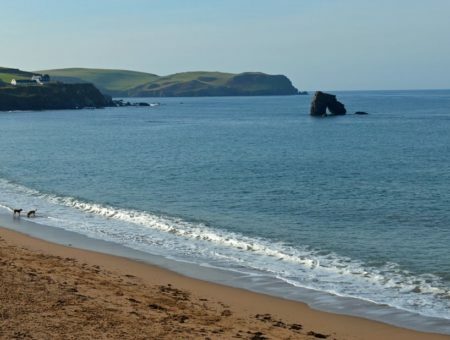 Bantham Beach is located in the perfect spot for walks from Thurlestone beach, South Milton Sands or Hope Cove, the last of which is an eight-mile return trip up and down some challenging hills. During low tide you can walk on the sand from Bantham to Bigbury beach and onward along the land bridge to Burgh Island, although careful planning is advised. Otherwise simply stick to Coast Path. Running from May to September, there is a seasonal ferry that carries passengers across the River Avon from Bantham Slipway to Cockleridge Ham (Bigbury-on-sea). The ferry operates from Monday to Saturday, between 11 am and 12 noon, and 3 pm to 4 pm. Call (01548) 561196 for further information. With space for over 1000 cars, there’s ample parking at Bantham Beach. The car park is a level walk of around 100 metres from the sand. Toilet facilities are located at the village-side of the car park, and on the beach-side you’ll find the Gastrobus. Parking in high season is £6 for the day, and falls as low as £2 in the off season. Cars must be removed from the car park by 9 pm in high season and earlier at other times of the year, depending on the daylight. Look out for a sign by the entrance to the car park informing you of the closing time for that day, or check with the gatekeeper if you’re unsure. There is a charge of £25 to release your car after closing time. If you’ll be spending a lot of time at Bantham Beach, consider getting a weekly (£25) or fortnightly (£40) ticket. Annual passes are available for £90 if you’ll be there even longer. Bantham Beach is where expansive sands, shallow waters, surfable waves and stunning scenery come together to create one of South Devon’s most popular natural attractions. Indeed, its popularity is such that it ranks highly not only within our region – and not even just across the country as a whole – because the Lonely Planet ranked Bantham amongst the top 10 beaches in Europe in 2015. As its owners have proudly pointed out, Bantham Beach is the only English beach on the list, underlining what an impressive achievement this is. Like its neighbour at Bigbury-on-Sea, Bantham Beach looks out over Burgh Island, the sight of which inspired the late Dame Agatha Christie to write her best-selling novel, ‘And then there were none’. You can reach this island on foot from Bigbury beach during low tide or by riding on the popular sea tractor from the same starting point. Getting to Bigbury from Bantham is easy enough, either by walking along the beach when the tide is out, taking the Coast Path, or riding the passenger ferry in high season. 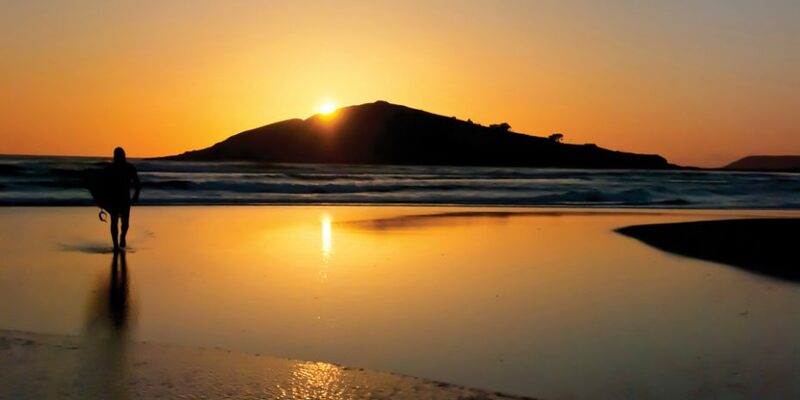 On the other hand, once the panorama of Bantham Beach opens out before you, you’ll be reluctant to go anywhere until the sun disappears behind the horizon. All the facilities are on hand for a perfect day at the beach, whether you’re coming alone, with friends, as a couple or with a young family. Those in the latter category will be pleased to know that when the tide is low, the beach becomes dotted with shallow pools that make for excellent paddling for the little ones. Primarily, however, Bantham Beach is famed for its waves, and as such has become one of the most popular surfing spots in the south west. Bantham Surfing Academy offers lessons from beginner to advanced and will also hire out all the equipment you need to practise by yourself. 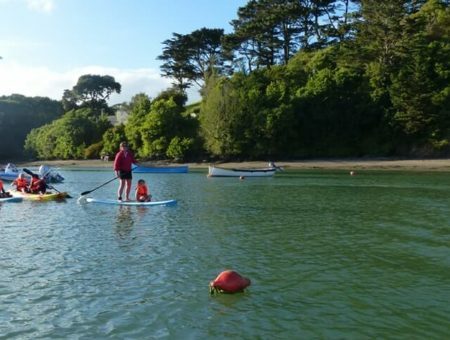 If surfing’s not your thing, why not consider taking lessons in stand-up paddleboarding instead? Toilet facilities are located by the entrance to the car park and towards the beach you’ll find the Gastrobus, where you can pick up locally-sourced snacks and drinks, either to take back to beach or to enjoy at one of their outside tables. The Gastrobus is open 10 am to 7 pm depending on the season and the weather. Keep an eye on their Facebook page for details about their upcoming summer barbecues. For more facilities, take a short walk to Bantham village, where you’ll find the Sloop Inn, which offers an extensive menu, and the village stores. 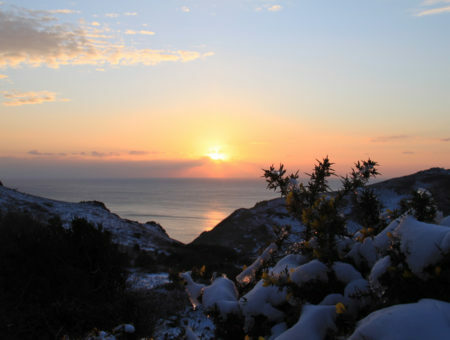 Bantham Beach is located on an ideal spot along the South West Coast Path to choose from a range of hikes, from all-day treks to manageable strolls that will take a couple of hours or less. Bantham to Hope Cove’s beaches is an eight-mile round trip with some nice stopping points along the way, namely Thurlestone beach and South Milton Sands. Salcombe is a further eight miles from Hope Cove so this is only a walk for those with plenty of stamina! The views from the Coast Path are truly breathtaking, especially as Burgh Island comes into view between Thurlestone Sands and Bantham Beach. In the other direction, past Bigbury-on-Sea you’ll come to Challaborough beach less than half a mile to the north. Beyond this sheltered cove, the terrain becomes more rugged and undeveloped on the way to the River Erme and onwards to Noss Mayo and the River Yealm. The South West Coast Path’s website has details about crossing the rivers and advises planning your journey carefully. Include a trip to Bantham Beach in your Devon holiday plans and you’ll quickly see why it’s become such a well-loved destination for families, surfers and everyone who loves to be by the water. After a session of surfing, swimming or even just soaking up the sun, you’ll be in need of some sustenance. Fortunately, there are two popular eateries to choose from, one backing onto the beach and the other just a stone’s throw from the car park. The Gastrobus at Bantham, as its name suggests, is part gourmet café-restaurant and part food van. Well known for serving delicious street food, irresistible sweet treats and aromatic coffees, it plays a big part in making Bantham Beach such a top summer attraction. The seasonal Gastrobus, Gastropizza and Gastro Treats vans are found at the edge of the Bantham Beach car park (towards the beach). There’s also one at Thurlestone, in the north car park. We caught up with founder, Claire Bishop, who parked the Gastrobus at Bantham Beach for the first time in 2012. Where did the idea for the Gastrobus come from? What sets the Gastrobus apart from a typical van you’d see by a beach in the summer? You’ve recently branched out beyond Bantham Beach, but since that’s where it all began we’d like to ask why you picked Bantham? What makes it such a special beach in your opinion? What kinds of events do you hold and where can people find out more? “During the summer holidays our pizza van is open evenings from 3pm – 8pm. We have live music on Saturday nights during the summer holidays from 5pm. Details can be found on our Facebook Page. For information about opening dates and times, images and videos, check out the Gastrobus website. Just a few steps from the beach car park, you’ll find the Sloop Inn, a 14th century former coaching house with a reputation for good food and friendly service. Choose from an extensive menu, with homemade meat, seafood and vegetarian dishes, plus light bite options during the day. Perhaps better known as a restaurant than a bar, the opening hours are based around meal times (11:30am – 2:30pm and 6pm – 11pm Monday to Friday, and 12pm – 11pm during the weekends). Booking is highly recommended, especially during the holiday season. Find out more about the Sloop Inn and browse the menu here: http://thesloop.co.uk. Dogs are permitted at Bantham throughout the year, but there are important restrictions. Between 1st May and 30th December, dogs are not allowed on the main beach. However, there is a large sandy area beside the estuary where your four-legged friend is welcome at all times of year. The dog-friendly area is signposted, but the owners suggest you ask the gatekeeper upon arrival for guidance if you’re unsure. Now in their ninth season, Bantham Surfing Academy is a Surfing England-recognised centre of excellence, meaning they meet the highest standards of the national governing body. For many people, Bantham Beach is synonymous with surfing. We caught up with David Renaud from Bantham Surfing Academy to ask him what makes this famous spot so suited to the sport. How about if you’re interested in trying your hand at surfing? Learn more about Bantham Surfing Academy today. Now entering its fourth year, the Bantham Swoosh is a 6 km wild swimming race which has quickly become a major fixture on the annual calendar of this growing sport. Billed as a low-key event, in keeping with the natural beauty of the venue, there is a minimal infrastructure at the Bantham Swoosh, allowing swimmers and spectators to appreciate the scenery as well as the sporting entertainment. The ‘race’ starts at Aveton Gifford and proceeds to Bantham Beach, although the organisers stress that it’s only a competition for those who wish to treat it as one. There’s no cut off time for slower swimmers, but you’ll need to confirm that you are fit and competent in the water before being allowed to register. Around 850 swimmers participated in the most recent race, which took place on 24th June 2017. There were two swims, one at dawn and the other at dusk. Some swimmers even raced in both! Anglers can be a secretive lot, jealously guarding their local knowledge which is often gained through years of experimentation and hard-won experience. But as we’re lucky enough to have one such fisherman on our team, we’ve been able to bring you some valuable insider knowledge. Where’s the best place to fish at Bantham in your experience? What baits do you recommend and where do you get them? “I fish mostly for bass, but I have caught small eyed ray, plaice and even small halibut. I find the best time to fish for bass is around September, but they can be caught from April – November. I normally fish at night. I have on occasions caught over 40 bass in one session, but most are school bass and are returned safely. I will keep one fish if it is over the size limit of 16.5 inches. Looking for a holiday cottage near beautiful Bantham Beach? The Old Milking Shed is a beautifully converted and immaculately presented barn, just a 15-minute walk away. In nearby Thurlestone, a short drive or walk along the South West Coast Path, we offer a range of 27 stunning holiday homes. These include marine apartments at Thurlestone Rock, offering spectacular coastal views from their position at the water’s edge, to Links Cottage, a spacious detached house overlooking Thurlestone and towards Bigbury Bay from the unspoilt Yarmer Estate. Discover our extensive range of around 400 holiday homes exclusively in South Devon here. 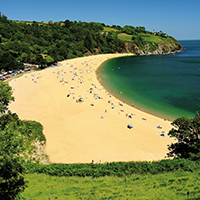 Visit our ‘Beach Bible’ for comprehensive information about the best beaches in South Devon. Visit a golf course near Bantham during your stay too. Find golf clubs in South Devon here. Other scenic beaches in South Devon with similar facilities include nearby Bigbury-on-Sea and South Milton Sands, and towards Dartmouth you may wish to consider Blackpool Sands.